Summer vacation is just two months away, so if you like to involve your grandchildren in fun projects, take a look at this idea I found on Pinterest this morning! You'll find all the specifics for making your own "nebula" at this link - along with a photo tutorial. It looks fairly simple and fun! 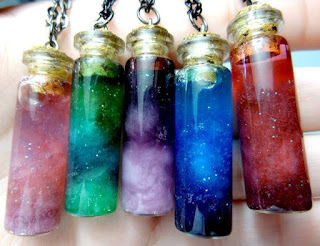 Children could make them to give siblings to place in their room or the little necklaces to give their mother - along with a card which says their love for them is bigger than the universe! Or something along this line! As you make this project, it gives you a wonderful opportunity to talk with your grandchildren about what a nebula is and how God created the universe! Spend time thanking and praising God for the amazing universe He created - and maybe some summer evening in the coming months, you will be able to spend time looking at the night sky together.